These strawberry crumb bars are “jam” packed full of everything you wish for in a summer baked treat. With a double-duty dough (crust and crumble topping), these bars are so so easy to make! Please don’t yell at me for posting another delightful dessert recipe this week – I just can’t help myself! First the blackberry oatmeal pie bars, now these strawberry crumb bars. Either of the two would be an outstanding choice for your next reason to make dessert but let me tell you a little secret behind these here bars…it’s not strawberry season yet here in New England. In fact, we’ve got another month to go before any picking goes on but the great thing about strawberries shipped in from Florida in the middle of April is that in spite of the fact that you know they’re not local and thus don’t taste nearly as fantastic as local strawberries do, they’re still damn good in these crumb bars. For these strawberry crumb bars, the strawberries are baked into the form of a buttery hand-held crumble and let me tell you: they are truly irresistible! The bars soften and sweeten into everything you long for in a summer strawberry. Need I say more? I made a half-batch and brought them to a meeting with some of my staff at work and there may have been a couple of people who took a few extra bars in napkins just in case they vanished before seconds could be claimed. Not that I was watching or anything…but doesn’t every food blogger have an eye on the food to see how quickly it disappears? Gosh, I hope I’m not the only one. Preheat the oven to 375° F. Grease a 13×9 inch pan; set aside. In a medium bowl, combine 1 cup of the sugar, the baking powder and flour. Mix in the salt and the lemon zest, and stir together with a fork. Cut in the butter and egg with a pastry blender (or two knives if you don’t have one) until the largest chunks are about pea-sized. The mixture should be crumbly without much loose flour. Spread about half of the dough mixture in an even layer over the bottom of the prepared pan and press down firmly to form the bottom crust. In another bowl, stir together the remaining sugar, cornstarch and lemon juice. Gently mix in the strawberries with a rubber spatula until combined. Spread the berry mixture evenly over the bottom crust. Crumble the remaining dough over the top of the berries. Strawberries grow year-round here in San Diego so I’ll definitely need to try these! They look wonderful. I saw these in my GR this morning and have been craving one all morning. Just wish I had an oven to make these in France, especially since strawberries are in season here! Oh well, cannot wait to make them when I return to Canada! These look wonderful and refreshing! I made strawberry crisp the other night… divine! These bars look beautiful! I love that they use fresh strawberries too. Can’t wait for strawberry picking season to begin! These look amazing and I think they are what will become of the strawberries in my fridge! I did notice the recipe says 1/2 cup (2 sticks) butter…not sure if that really is supposed to be 1/2 a cup or 2 sticks since they are different amounts, let me know, thanks! Jamie: Thanks for the head’s up – I just made the change. Strawberries are in full swing here in Tennessee. I cannot wait to make these. They look absolutely wonderful! Oh these bars look/sound heavenly!! These look great! I can’t wait for berry season. I’ll give this recipe a try when summer rolls around…. 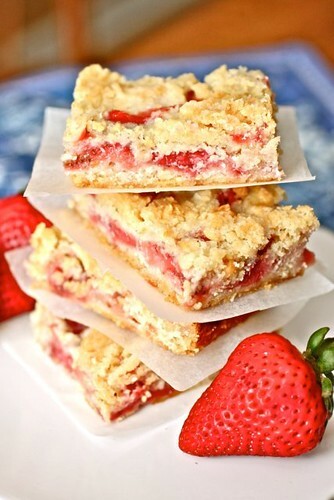 I did a strawberry streusel bar sort of like these a few months ago and they were so addictive. Now, your bars would be so great with a scoop of vanilla ice cream since the weather has turned warm. these look absolutely amazing! i will definitely be giving these a try! The strawberries at the store right now are so ripe and sweet. They would be so good in these crumb bars! They look delicious! I just bought fresh strawberries. Is this a sign? These bars look just the perfect snack for my long mornings at work! NICE! Staff crumble-sneakage is sure proof those little beauties were as delicious as they look. Well done! I just made these and they’re fantastic! It’s like having a little piece of strawberry pie. I also love the hint of lemon in these–the perfect spring/summer dessert. Look scrumptious, can’t wait to try them. Also, wanted to try the blueberry creamcheese recipe as well but I keep getting “that page is unavailable”. could these strawberry bars be made with frozen berries or even rasberries as our strawberry season is pretty much over? Carol: Yes, you can make them with frozen (drained) berries. You could also make them with fresh blueberries, apples, peaches, or raspberries as I have seen made by other bloggers in the past. Does anyone have the recipe for the blackberry oatmeal bars? Oh mmmmmmmmmmmmm, think these are next on my list of “to bake”!! Do these need to be refrigerated when storing? Anyone Know if I could cut the recipe in half ? I really want to make these but only have 2 cups of strawberries handy! Courtney: Yes, you can halve the recipe and bake the bars in an 8×8-inch baking pan. Do you think these would freeze well? I have fresh strawberries now and would love to make a couple of batches while they are still good! Jordan: I don’t really know if they freeze well but I imagine they might end up a little soggy after thawing. Anyone know if I can use Frozen strawberries? If so how much? I guess I would drain the juice… Right. Sena: I really don’t think frozen berries would work well here, even if you drained them – they still contain too much water. I used frozen blueberries and didnt even thaw it, it came out just fine. not soggy at all. I used 2 cups of frozen blueberries instead of strawberries and i also used spelt flour instead of all purpose flour. i also only put 3/4 cup of sugar in the crumb and it was perfect! It turned out really good and not too sweet. I had a big sized lemon- so I really tasted the zest so as it seems I went a little overkill on it. I now know for next time….